Of the 207 Serious Adverse Events (SAEs) following treatment with Mectizan® (ivermectin, Merck, Sharpe & Dohme) that were reported from 1989 to 2001 through the passive SAE surveillance system required of all onchocerciasis mass treatment programs, 65 were cases of 'Probable' or 'Possible' Loa loa Encephalopathy temporally Related to treatment with Mectizan® (PLERM). A retrospective analysis of these 65 PLERM cases revealed that 97% were from southern Cameroon, 85% were male and 93% were being treated with ivermectin for the first time. The mean time to onset of symptoms was 1.7 days (95% CI: 1.3, 2.2) but the mean time to receiving medical attention after the onset of symptoms was 2.0 days (95% CI: 1.5, 2.6). Hospitalization was reported in 53 cases with a mean duration of 27.5 days (95% CI: 13.3, 41.6, n = 35). Clinical outcome was reported in 34 cases: 64.7% recovered fully, 11.8% had partial neurologic deficit and 23.5% died. For the 32 cases where quantitative L. loa data were reported, the arithmetic means with 95% confidence intervals were for 1) peripheral blood: pre-treatment – 164,250 mf/ml (79,537, 248,963; n = 4); post-treatment within 1 month – 3926 mf/ml (2,128, 5,725; n = 21) and within 5 to 6 months – 7800 mf/ml (3417, 12,183; n = 7); and for 2) cerebrospinal fluid: 32 mf/ml (7, 37; n = 10) within 1 month post-treatment. Pending further research on practical methods to exclude individuals with high intensity L. loa infection from onchocerciasis mass treatment programs, more emphasis should be placed on surveillance and monitoring to ensure early recognition, referral and management of SAEs, during the first 2 years when majority of the population is presumably naïve to ivermectin. The demonstration of the safety and effectiveness of Mectizan® (ivermectin, Merck, Sharpe & Dohme) as a microfilaricidal agent against Onchocerca volvulus, and the decision of the manufacturer, Merck & Co., Inc. in 1987, to donate the drug to all who need it for as long as it is needed for the treatment of onchocerciasis was of critical importance to the control of onchocerciasis which had previously relied primarily on vector control [1, 2]. Over the past 15 years, considerable amounts of financial, logistical and human resources have been mobilized by local, national and international health authorities to implement ivermectin mass treatment programs in countries where onchocerciasis is highly endemic [3, 4]. Entire communities, in which people with onchocerciasis and/or at high risk of the disease reside, have been treated annually, or in some instances more frequently, with ivermectin since 1989. Serious Adverse Events (SAEs) (See Note) associated with ivermectin treatment were found to be rare in clinical and community trials [1, 5, 6]. Reports received through the passive surveillance system, established in countries where mass treatment with ivermectin for the control of onchocerciasis has been operational, have provided further confirmation of this observation. A total of 207 SAE cases were reported from January 1989 to December 2001, giving rise to a cumulative incidence of 1 reported SAE per 800,000 reported treatments of ivermectin . These numbers are reassuring when viewed as a whole. However, when these data are disaggregated geographically, as well as by type of clinical presentation, concerning trends emerge. Approximately 85% of the reported SAE cases originated from Cameroon (i.e. 176 out of 207) while the remaining 31 cases were reported from neighboring countries in Central Africa (Central African Republic, Democratic Republic of the Congo and Sudan) as well as East Africa (Ethiopia) and West Africa (Nigeria and Liberia) . The most common clinical presentation documented on the SAE reports was encephalopathy following ivermectin treatment; this represented 50% of the cases (103 out of 207) . In 63% of these encephalopathic cases (65 out of 103), there was a documented association with loiasis. Loiasis is caused by infection with Loa loa, a filarial parasite, and is endemic in certain regions of Central and West Africa, the former of which has the highest prevalence and intensity of infection . The disease typically presents with temporary localized edema (Calabar swellings), episodic subconjunctival migration of the adult worm, dermatitis and fatigue . Rarely, L. loa has been determined to be the causative factor in spontaneous cases of encephalopathy wherein the patients' cerebrospinal fluid (CSF) and/or blood were positive for L. loa microfilariae . In a literature review by van Bogaert and colleagues, several cases of this syndrome were described; they were manifested by some of the following symptoms and signs in a progressive or intermittent manner: rigors, hyperpyrexia, headache, vomiting, hypertonia, confusion, agitation, torpor, coma, hemiplegia, aphasia, personality change, transient ocular signs and a meningeal syndrome . It has also been demonstrated that treatment with microfilaricidal agents such as ivermectin and diethylcarbamazine provoke the passage of L. loa microfilariae into the CSF and precipitate an encephalopathy similar to that seen in spontaneous cases [10, 11]. There is no definitive treatment for L. loa encephalopathy; only supportive care is recommended. Previous research on the development of L. loa encephalopathy following ivermectin treatment has demonstrated an association with 'high' levels of pre-treatment L. loa microfilariae, with 'high' being variously described as greater than 10,000 microfilariae per milliliter of peripheral blood (mf/ml) by a group of experts convened by the Mectizan® Donation Program (MDP) in 1995 to conduct an independent review of reported cases of probable L. loa encephalopathy following ivermectin treatment, or greater than 30,000 mf/ml in a hospital study in southern Cameroon  or greater than 50,000 mf/ml in a community trial in southern Cameroon . All encephalopathic cases temporally related to ivermectin treatment occurring in onchocerciasis mass treatment programs that have ever been reported to the MDP have been systematically screened for documentation of infection with L. loa, and categorized according to the case definitions in Table 1. The categorization of the 103 encephalopathic cases reported to the MDP from January 1, 1989 to December 31, 2001 and their geographical distribution are shown in Table 2 and Figure 1 respectively. Included in these illustrations are the 65 encephalopathic cases which had documented infection with L. loa such that they met the presumptive diagnosis of 'probable' or 'possible' case of L. loa encephalopathy temporally related to ivermectin treatment as defined in Table 1. The demographic and clinical description of these 65 cases of L. loa encephalopathy following ivermectin treatment forms the subject of this paper. To date, the published literature on this clinical entity has been limited to case reports and case series of a few patients, because it occurs so rarely. To our knowledge, this is the first paper that systematically reviews a large number of such patients. The implications for mass treatment strategies using ivermectin are discussed. Onset of Central Nervous System (CNS) symptoms and signs within 7 days of treatment with ivermectin; illness progressing to coma without remission. Peripheral blood L. loa > 10,000 mf/ml pre-treatment or > 1,000 mf/ml within 1 month post-treatment or > 2700 mf/ml within 6 months of treatment; and/or L. loa microfilariae present in cerebrospinal fluid (CSF) within 1 month post-treatment. Semi-quantitative or non-quantitative positive (i.e. +, ++, +++) L. loa microfilariae in peripheral blood within 1 month post-treatment. Clinical and/or laboratory findings are inadequate to determine probable etiology. *These definitions were adapted from those originally put forth, by a group of independent experts that consulted for the MDP in 1995 in the following ways: 1 the timeframe within which a case would be considered was extended from 5 to 7 days because a prospective study published in 1997 showed that the onset of symptoms may be as late as 7 days post treatment ; 2 the interval between ivermectin treatment and initial L. loa laboratory studies was shortened to 1 month since a later study had shown that L. loa microfilarial loads decrease by 96% of pre-treatment levels 1 month after a single standard dose of ivermectin ; 3 the thresholds for the quantitative L. loa laboratory studies were broadened to include samples taken 5 or 6 months post-treatment since several cases in Cameroon who were treated in peripheral health centers and had no laboratory studies performed initially, were subsequently evaluated in their villages by a team of clinicians sponsored by the national-level Ministry of Health; the figure of 2700 mf/ml at 6 months was derived from a calculation based on the finding that on average L. loa microfilarial loads are reduced by at least 73% 6 months after a single standard dose of ivermectin ; 4 the category of 'possible' L. loa encephalopathy was added to the list of presumptive diagnoses to better capture the reality of the field situation where most of the encephalopathic cases were treated in peripheral hospitals which were not equipped to perform lumbar punctures or quantitative L. loa microfilaremia studies until very recently. *cases reported as of August 31, 2002; †see Figure 1 for definitions of types of encephalopathy; ‡case of cerebral malaria. A review of all SAE cases temporarily associated with ivermectin treatment occurring from January 1, 1989 to December 31, 2001 that have been reported to the MDP is published elsewhere in this series . This retrospective analysis of 'probable' and 'possible' cases of L. loa encephalopathy temporally related to ivermectin treatment during the same time period represents a subset of those reported SAE cases. For the purposes of this analysis, the 'probable' and the 'possible' cases have been grouped together and termed as PLERM (Probable or Possible L . loa Encephalopathy temporally Related to treatment with Mectizan®). The demographic and clinical features analyzed were as follows: age, gender, pre-existing health status, first-time exposure to ivermectin, time interval between administration of ivermectin and onset of symptoms, time interval from onset of symptoms to receiving medical attention, medical management, L. loa laboratory studies and clinical outcome. There were insufficient data to include an analysis of co-infection with any other parasites. Data were abstracted from the SAE reports and medical records received by the MDP from onchocerciasis mass treatment programs through a passive surveillance system. These data were entered into a database using Filemaker Pro Version 5.0 software (Filemaker Inc., Santa Clara, CA, USA http://www.filemaker.com/) and were maintained by the MDP as part of its routine program activities. The data were analyzed with the SAS System for Windows Version 8.2 (SAS Institute, Cary, NC, USA http://www.sas.com/). Sixty-three of the 65 reported PLERM cases (97%) were from Cameroon. 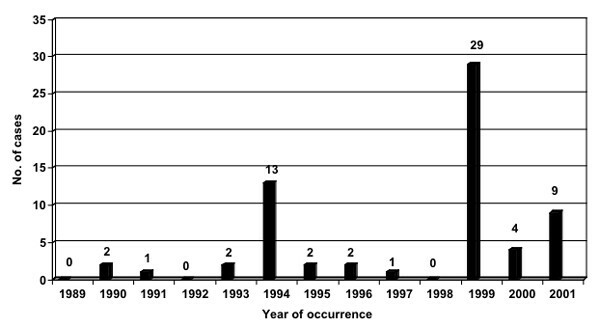 Figure 2 illustrates the frequency of reporting of PLERM cases from 1989 to 2001. Peak reporting occurred in 1994 and 1999 from Central Province in Cameroon, coincident with the expansion of ivermectin mass treatment programs into onchocerciasis endemic areas where the majority of the population was presumably naïve to ivermectin. Since data were incomplete for certain variables analyzed, the number of entries available for each result is provided in parentheses. Eighty percent of the PLERM cases were male (n = 65). The mean age of PLERM cases was 39.8 years (95% CI: 36.2, 43.4; n = 64). The age distribution is shown in Table 3. Of those whose prior exposure to ivermectin was known (n = 44), 93% were being treated with it for the first time. The patient's general health status prior to taking ivermectin was reported in 38 cases, 97% of which was documented as 'good', as opposed to 'fair' or 'poor'. *cases reported as of August 31, 2002; †the age of 1 case was unknown. The symptoms and signs most frequently manifested by the PLERM cases are illustrated in Table 4. Data were unavailable to determine the progression of symptoms over time. The mean time to onset of symptoms after ivermectin treatment was 1.7 days (95% CI: 1.3, 2.2; n = 31). Data were insufficient to distinguish between the time to onset of non-neurologic and neurologic symptoms. The mean time to receive medical attention after onset of symptoms was 2.0 days (95% CI: 1.5, 2.6; n = 53). Medical management consisted primarily of supportive treatment: 69% intravenous fluids, 55% corticosteroids, 43% vitamin B complex, 26% antibiotics, 24% antipyretics, analgesics or nonsteroidal anti-inflammatory agents, and 23% antimalarial therapy. Fifty-three patients were reported as being hospitalized; in the remaining 12 cases this was not documented. The mean duration of hospitalization was 27.5 days (95% CI: 13.3, 41.6; n = 35). Clinical outcomes were documented in only 34 out of the 65 cases (52%); these are shown in Table 5. In the 8 fatal cases, whom were all hospitalized, the immediate antecedents to death were reported in 5 of them: infected decubitus ulcers (n = 3), systemic metabolic disorder (n = 2). *cases reported as of August 31, 2002. *cases reported as of August 31, 2002; †clinical outcome of 31 cases unknown. By definition, 'possible' PLERM cases (n = 33) had only semi-quantitative or qualitative studies and thus could not be included in a quantitative analysis. PLERM cases which were 'probable' (n = 32) had quantitative L. loa peripheral blood studies measured either pre-treatment or post-treatment at varying time points in the illness and/or quantitative or qualitative L. loa studies of the CSF. Since the exact temporal relationship with ivermectin treatment was not always recorded, the post-treatment L. loa laboratory data were grouped into 2 broad categories: 1) within 1 month post-treatment; and 2) at subsequent follow-up 5 to 6 months after treatment. These data are shown for the 32 'probable' cases in Table 6. This retrospective analysis of 65 reported PLERM cases from onchocerciasis mass treatment programs (97% of which were from Cameroon) has shown that the majority of cases were male. Peak reporting occurred in years when onchocerciasis mass treatment programs were expanded to areas where the population was generally naïve to ivermectin; this is consistent with the finding that over 90% of PLERM cases reported first exposure to ivermectin. The mean age of PLERM cases was about 40 years and more than one-third of the cases were between the ages of 30 and 44 years. Symptoms and signs generally developed within 2 days but there was a delay of an additional 2 days before the patient received medical attention. Supportive care was the mainstay of medical management. Most patients were hospitalized for about a month. Clinical outcome was reported in only 53% of cases; of these the majority recovered fully while about a quarter of them died. The arithmetic mean L. loa micofilarial load within 1 month post-treatment was approximately 4000 mf/ml. The limitations of this dataset need to be explicitly stated in order to place these results in their appropriate context. First, there were substantial amounts of data missing, almost 50% for some of the variables analyzed. To some extent, this reflects the evolution of the SAE reporting form during the time period under review. 1) The SAE reporting form has been revised 3 or 4 times during the 13 years under review. Thus, the data received from the field differed in the depth of detail that was documented over the years. In particular, a specific question of L. loa infection was not included on the form until 1997 although there was always room to report whatever information the clinician believed to be relevant even if it was not specifically requested on the form. 2) The SAE reporting form (both previous and current versions) requested clinicians to primarily write free text as opposed to choose one out of a range of options. This system provided for richness of data on the one hand, but constrained standardization of data for the purposes of statistical analysis, on the other hand. Even when check boxes were provided they were sometimes left blank. Second, determination of the extent to which the true number of PLERM cases has been reported is limited because almost all the PLERM cases analyzed in this paper were reported spontaneously in a passive, rather than active, surveillance system. A passive surveillance system such as this depends on four key factors: 1) the awareness of clinicians at all levels of the health care system to make a temporal association between the clinical condition and antecedent ivermectin treatment; 2) clinician knowledge of the typical and atypical adverse events temporally associated with ivermectin treatment; 3) the extent to which diagnostic tests were performed in an appropriate and timely manner; and 4) the integrity of the adverse drug reaction reporting system for ivermectin (and other pharmaceuticals in general) from peripheral levels to a central health authority in-country and finally to the MDP. Given the variability of reporting from the 34 onchocerciasis-endemic countries that have had, or have, ivermectin mass treatment programs, it is unknown what the true numbers of SAE cases in general, and PLERM cases in particular, are. Finally, since 37 of the reported 103 encephalopathic cases had insufficient clinical and laboratory information documented to determine a presumptive etiology (see Table 2), it is probable that the number of PLERM cases has been underestimated in this analysis especially as most of them were also reported from L. loa endemic areas of southern Cameroon. Notwithstanding the stated limitations, the major findings from this analysis are worthy of some discussion. First, the observation that more than one-third of the reported PLERM cases were between the ages of 30 and 44 is consistent with a previously published community trial which showed that individuals within this age group are at greatest risk of developing SAEs . However in that study neurologic, and non-neurologic SAEs were combined for the analysis. Second, the finding that males constituted 85% of the reported PLERM cases is striking. Of note, 85% of the published case reports on PLERM (i.e. 11 out of 13) have also been male [13, 14]. Whether this represents a true gender distribution of disease is unknown since these studies, including the present one, were not designed to test this hypothesis. Further research investigating gender differences in the exposure to Chrysops spp. (the vector of L. loa), L. loa microfilarial intensity, susceptibility to L. loa encephalopathy following ivermectin treatment independent of the intensity of L. loa infection, health-seeking behaviors or other such factors may provide some insight into this question. Third, the observation that 93% of cases were being treated with ivermectin for the first time is important biologically as well as programmatically. Since ivermectin kills the microfilariae of both O. volvulus and L. loa , and the rapid destruction of a large burden of L. loa microfilariae has been temporally related to L. loa encephalopathy following ivermectin treatment , and L. loa microfilarial loads have been shown to decrease by 96% after 1 month of single-dose treatment , this result is consistent with the putative pathogenesis of L. loa encephalopathy following ivermectin treatment. Furthermore, from a programmatic perspective, this could have substantial implications on the human and financial resources needed for mass treatment programs in L. loa endemic areas. Field personnel in these areas could limit the intensive training and surveillance for the management of SAEs to the first 2 years of the program when the majority of the population is expected to be naïve to ivermectin, if high treatment coverage is attained initially and maintained over time. Fourth, symptoms and signs (non-neurologic and/or neurologic) of the adverse drug event generally began within the first 48 hours of treatment; this is consistent with published clinical case reports [13, 14]. In the present study, data were insufficient to distinguish between the onset of non-neurologic and neurologic symptoms. However, Gardon and colleagues have argued that the clinical sequelae following ivermectin treatment in people with high L. loa microfilarial loads represent a continuum with the follow stages: "mild", "marked", "serious non-neurologic" and "serious neurologic" . In their prospective study during which 2 PLERM cases occurred, alteration of consciousness began 3–4 days after ivermectin treatment. Thus, it may be useful for field programs in L. loa endemic areas to further intensify their surveillance activities during the first 4 days following mass treatment. Interpretation of the data on L. loa microfilaremia is limited since about half of the cases met the definition of PLERM due to qualitative or semi-quantitative data (i.e. the 'Possible' cases'). However for the 20 cases where post-treatment microfilaremia levels were available within 1 month of treatment, the arithmetic mean value of 4000 mf/ml suggests that pre-treatment levels were probably much higher than 10,000 mf/ml, the risk threshold proposed by the first independent consultation of experts on this clinical entity and perhaps closer to 100,000 mf/ml if one estimates a 96% reduction in pre-treatment levels after 1 month as demonstrated by Kombila and colleagues . Given the inter-individual variability in the decline of L. loa microfilarial loads after treatment and the rather wide interval of 1 month used in this study, further research is required to re-assess the rate of decline of L. loa microfilaremia within 1 week of treatment with ivermectin since that is the time frame within which most patients present for medical care. There were insufficient data to analyze the potential role of co-infection with Plasmodium falciparum or other parasites that sometimes manifest as encephalopathic illnesses which could either increase susceptibility to the development of L. loa encephalopathy following ivermectin treatment or serve as confounding factors in this analysis. In summary, SAEs following ivermectin administration in onchocerciasis mass treatment programs are very rare: 1 reported case per 800,000 treatments from the passive surveillance system of the MDP. Overall, reported PLERM cases are also quite rare even in Cameroon, as demonstrated in a prospective study conducted in southern Cameroon – which showed an incidence of PLERM of approximately 1 per 10,000 treatments administered in an onchocerciasis mass treatment program . However, the incidence of PLERM appears to vary considerably within L. loa endemic areas . 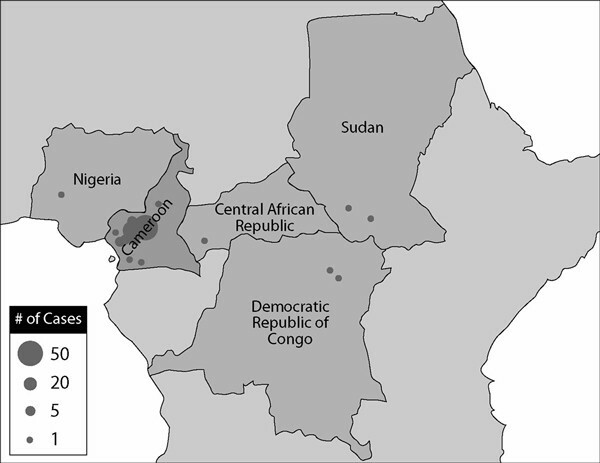 Further research is needed to investigate possible geographic differences in the genetics of the human host, and/or the strain of L. loa and/or the Chrysops vector, and/or other environmental putative etiologic factors that increase the vulnerability of populations in some parts of southern Cameroon to developing L. loa encephalopathy following treatment with ivermectin. The current strategies for onchocerciasis mass treatment programs using ivermectin emphasize community rather than individual assessment of the risk of onchocerciasis. Since 2000, the Mectizan® Expert Committee has recommended additional measures for onchocerciasis mass treatment areas where loiasis is co-endemic that aim to refine community risk of onchocerciasis at the village-by-village level rather than on a sampling framework, and increase the health education and awareness needed for SAE surveillance, referral and management. Recent investigation of a rapid epidemiologic technique for identifying communities with a high likelihood of having individuals at high risk of L. loa encephalopathy following ivermectin treatment based on the prevalence of the history of subconjunctival migration of the L. loa adult worm , is very encouraging. Once this technique is validated it could be applied in the field to exclude high-risk communities from onchocerciasis mass treatment programs with ivermectin or to identify communities where further enhancement of SAE surveillance and management is required if the risk of onchocercal blindness and skin disease is deemed to outweigh the risk of L. loa encephalopathy following ivermectin treatment such that mass treatment with ivermectin is believed to be indicated. However, there is currently no simple diagnostic tool with high specificity and sensitivity that can be easily applied under field conditions to exclude individuals at high risk for L. loa encephalopathy following ivermectin treatment; a consensus on the minimum L. loa microfilaremia risk level would need to be reached in order to ensure maximum effectiveness of the tool. Even if a risk threshold was reliably defined, collecting blood smears on all individuals eligible for mass treatment for parasitological assessment, with its requirement of skilled technicians and attendant risk of transmission of blood-borne infections, is not suitable for mass treatment programs. Thus, there is an urgent need for a non-invasive, rapid assessment tool that is highly sensitive and specific and can be reliably used by lay health workers who are most often the distributors of ivermectin at the community level. This tool, if developed, would also be of great importance to the Global Programme to Eliminate Lymphatic Filariasis (GPELF) since it too depends on mass treatment with ivermectin. In areas co-endemic for onchocerciasis and lymphatic filariasis (LF), the World Health Organization recommends annual mass co-administration of ivermectin and albendazole (donated by GlaxoSmithKline)  except for in L. loa endemic areas where the risk benefit assessment of mass treatment with this combination of drugs for the interruption of LF transmission as opposed to the treatment of LF disease, has weighed heavily against mass treatment since the launch of the GPELF in 1999 pending further safety research and monitoring. A screening tool for determining the risk of L. loa encephalopathy following ivermectin treatment on an individual level may facilitate the safe expansion of the GPELF into the L. loa endemic areas of Central and West Africa since global elimination of LF cannot be achieved using the currently recommended strategies if these areas continue to be excluded from mass treatment. In the absence of an individual screening tool, onchocerciasis mass treatment programs must continue to emphasize surveillance, monitoring, early detection, referral and management of SAE cases. The findings from this analysis could provide guidance in focusing the increased surveillance efforts on individuals at greatest risk of developing L. loa encephalopathy following ivermectin treatment during the first 4 days following mass treatment with ivermectin in the first 2 years of onchocerciasis mass treatment programs in L. loa endemic areas if high treatment coverage can be achieved initially and maintained over time. Sole author refined the L. loa encephalopathy case definitions, performed data entry, data analysis and manuscript preparation. • overdose (accidental or intentional). The author wishes to express sincere gratitude to the field partners of the Mectizan® Donation Program who reported the SAEs and to Dr. Björn Thylefors for editorial assistance with the manuscript. Author works for the Mectizan® Donation Program.